This article will present a new class of digital signage media players, introducing their features and benefits. We will also introduce PowerPlayer, which is based this new class of media player. PowerPlayer was designed as a low-cost digital signage solution targeting small business and non-technical users. In the past digital signage solutions were completely proprietary. You needed special digital signage player hardware for TV signage display. This created “vendor lock in”. Once you chose your digital signage media player you were wedded to the product vendor for life. PC sticks and compute sticks are a new class of low-cost digital signage players. 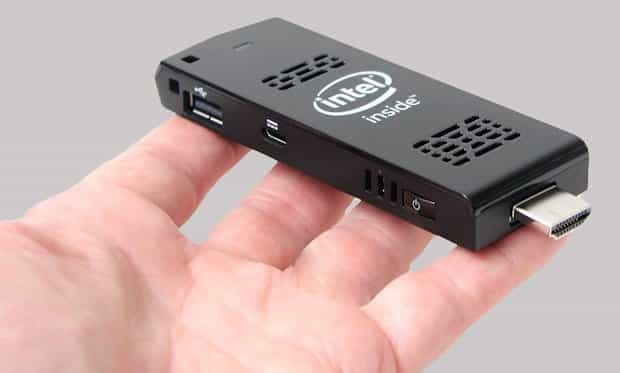 A PC or compute stick is actually a small palm-sized PC device that plugs directly into your TV’s HDMI source input. They typically run a standard operating software like Windows. What has this got to do with digital signage? To answer this question, it’s important to understand that the first generation digital signage media players were just “special purpose” PCs that ran digital signage player software designed by the product vendor. Because a stick is just a tiny PC, a product vendor can easily write digital signage player software to run on it. As PC and compute sticks are off-the-shelf devices sold in retail outlets you are not tied to any vendor-specific hardware for your digital signage TV endpoints. Choosing a stick that runs Windows offers your digital signage media player the widest range of playable media formats; particularly proprietary formats like PowerPoint® that can only be run on a Windows-based PC. And to handle high definition (HD) signage display you’ll need stick sporting a quad-core CPU with an integrated graphics controller. You can purchase full-featured Windows-based PC and computes stick from a wide range stores and online retailers like Amazon for a price from $100 to $150 USD. If you’re using WiFi Internet to connect to the digital signage CMS make sure your PC/compute stick has good WiFi performance. If there is a strong WiFi signal at your location you should not have a problem. However, if the WiFi signal is weak because of walls, floors and multipath interference, then the stick’s WiFi performance can become an important issue. You should select a PC/compute stick with a high WiFi antenna gain factor. The higher the antenna gain the better its ability to work with weak WiFi signals. By default most PC and compute sticks (in fact most standard PCs) will not automatically turn on and boot when power is applied. You have to press the stick’s power button. This becomes a problem if your site temporarily loses power: you have to manually turn on the PC stick. With power-on restart feature the PC or compute stick will turn on and boot whenever power is applied. You should check with the stick product vendor to determine if they support this feature and how to enable it; especially if you plan to have unattended TV signage points without some type of battery backup. When selecting a PC/compute stick for a digital signage media player consideration must be given to the operating environment. Will your signage display be indoors or outdoors? What are the expected high/low temperature ranges? PC and compute sticks tend to heat up so make sure the stick you select has an adequate cooling system. One of the benefits of using a low-cost Windows-based PC/compute stick is the ability to use PowerPoint for digital signage. PowerPoint is an ideal way to create signage content due to its flexible screen layout management, wide multimedia support, fonts choices, color palette selection and page animation/transition effects. To lower your operating cost you can use the free PowerPoint Viewer program on the PC stick to display PowerPoint signage presentations on your TV points. PowerPlayer™ is a complete, low-cost PowerPoint-based digital signage media player. 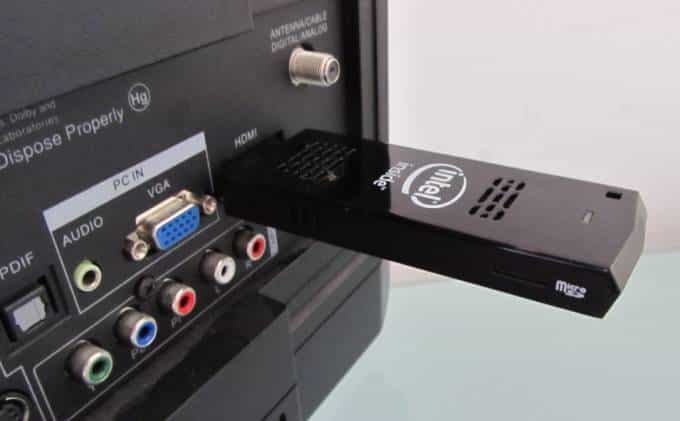 PowerPlayer is a Windows 10 mini-PC stick that plugs into your TV’s HDMI source input. PowerPlayer is bundled with PowerSignage™, our digital signage software. PowerSignage provides cloud-based storage and content management service (CMS). PowerSignage CMS makes it easy to upload, manage and display PowerPoint digital signage presentations on your TV screens. PowerPlayer automatically downloads signage presentations from the CMS and displays them on your TV screen. PowerPlayer’s plug-and-display feature, combined with PowerPoint, make it the ideal digital signage solution for small business and non-technical users. For more information take a look at our PowerPlayer brochure or visit our website at www.powerdigitalsignage.com. PowerPoint is a registered trademark of Microsoft Corporation. PowerSignage and PowerPlayer are trademarks of Power Media Design Pty Ltd.
We offer PowerSignage, a low-cost digital signage service. You can create and display kiosks, digital menu boards, and multimedia signage on any standard TV using PowerPoint. PowerSignage works with low-cost Windows-based PC sticks that you can buy from retailers like Amazon for around $100. To display digital signage you simply (Step #1) create your PowerPoint presentation and (Step #2) upload it to our cloud service. Then (Step #3) plug your PC stick into your TV’s HDMI source input, turn it on and install our software. The PC stick, running our software, automatically downloads and displays your PowerPoint signage presentations on your TV. for more information or send me an email.